CETACEA is new to the market and will be in New England all summer. "Cetacea" is offered by her owner following a terrific term of ownership. Recent attention to her interior, engine room and varnish have her in tip top condition. Previously, she had been lightly used "summers" then stored in a heated shed and maintained by one of New England's leading service yards, always kept in "bristol" condition. She is a traditional downeast style flybridge motor yacht powered by twin MAN 1100hp diesel inboards. She cruises in the 24-knot range with a top speed approaching 30 knots. Built using Cold Molded composite construction with high-quality materials and components. The hull form is Deep Vee with hard chines, a graceful sheer, significant bow flare and tumblehome aft. The original owner took advantage of the opportunity to incorporate numerous enhancements and system upgrades during production resulting in an exceptional example of this model. The vessel has dual helm stations, on the flybridge and (lower) in the forward starboard part of the salon. There is a comfortable cockpit aft with curved stair to the fly bridge. The lower deck has the Galley to port and three staterooms. There are two heads each with separate stall shower. The spacious master is forward with private head and w/ shower. Aft of the master and to port is a guest cabin with opposing upper and lower twin berths. Across the hall is the guest head w/ shower which is dual entry from the passageway as well as en-suite to the VIP guest cabin aft to Starboard. This cabin has fore & aft oriented twin berths. Machinery space is accessed via a deck hatch in the cockpit; the aft areas house system components, a watertight door in the forward bulkhead leads to the engine room which is equipped with twin Man engines, and there are two generators. The vessel offers wide side decks with SS Safety rails, superior ground tackle, and working foredeck. There are comfortable entertaining and dining spaces in the salon, cockpit, and flybridge. Tender handling is via cockpit transom door to the Teak swim platform and hydraulic Freedom Lift (tender not included). The spacious master cabin is forward with centerline island queen berth, quality mattress and custom bedding. There are sheer lockers, hanging lockers and drawers on each side with additional large drawers under the berth. The cabin has separate air conditioning/heat, TV w/ DVD, Stereo, DC lighting, opening deck hatch (1) and opening port lights (4). The master head with private entry is aft to starboard and has large counters, medicine cabinet, linen locker and separate stall shower. The portside cabin is valuable for additional family, guests or crew. It is arranged with fore-aft twin bunk outboard with athwartship upper twin bunk on the aft bulkhead. The inboard space beneath this bunk offers large drawers in the cabin. There is also a hanging locker and additional lockers and drawer storage. This comfortable guest cabin offers fore & aft oriented twin berths with night stands and a hanging locker and small settee. There are additional drawers and storage lockers. The guest head is ensuite to this cabin as well as entry from the main passageway. The galley is to port, and down three steps from the salon. It is open and spacious. The elimination of the overhead allows light from the windshield and salon windows to flood the space as well as virtually adjoining this area to the salon. The L-Shaped counters offer an abundant surface for cooking and contain the high-end appliances, ample storage lockers, and drawers. The AC/DC electrical panels are in the aft galley bulkhead at eye level allowing easy management of the system breakers and tank level gauges, etc. The lower helm occupies the forward starboard portion of the salon. It has a double bench seat with footrests. The sight lines fore and aft are excellent from this station. The large console has plenty of space to accommodate the flush mounted navigation instruments as well as system breakers and engine gauges. Thee is also a side console which supports the ZF electronic shifters, generator start panels, watermaker control and drink holders. •Battery boxes, hold down straps and covers. •Windshield wipers, triple, 24V DC with speed control, auto parking and fresh water wash.
•Wire fittings, marine grade, terminals, connectors, fuses, fittings and conduit. The Cold Molded composite construction creates a very strong, stiff yet light structure with excellent thermal qualities and sound suppression. The boat feels very solid and runs quietly through the water. "Cetacea" exhibits exceptional condition and excellent care and maintenance. 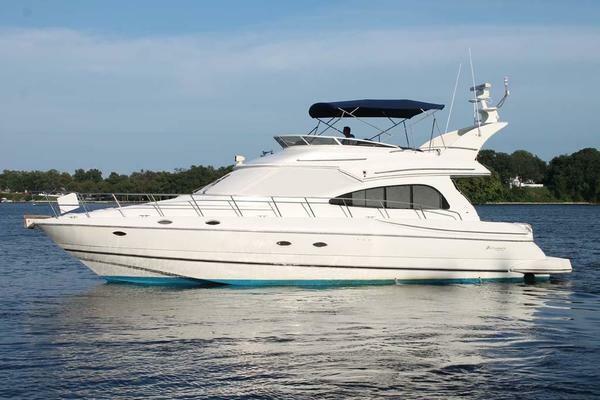 We encourage you to experience this boat if you are considering a traditional flybridge motoryacht in this size range. 12' tender and 40 hp 4-stroke Yamaha. Owners' personal belongings, loose items in the galley and other areas, tools, trophies, and art work. Any items seen aboard but not explicitly sated in the listing are excluded except spare parts.